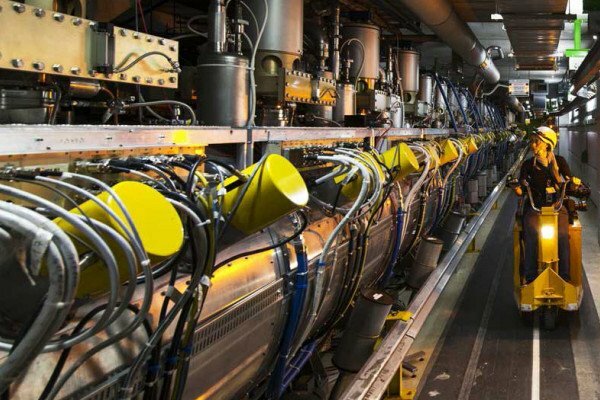 An international league of scientists is kicking off the decades-long process of developing the successor to the Large Hadron Collider, the world’s largest and most powerful particle accelerator. In 2012, the LHC confirmed the existence of the Higgs boson — the last unseen elemental particle in the Standard Model of physics, the one giving mass to all matter in our universe. But finding the Higgs boson ended up leaving physicists with more questions than answers. EuroCirCol, a four-year European-funded study, is now investigating future experiments and the technology needed to get there. The project is laying the foundation for a particle accelerator three times larger than the LHC, with double-strength magnets enabling researchers to smash particle beams together with a power of up to 100 tera electron Volts — an acceleration of particles roughly equivalent to 10 million lightning strikes. ‘When you look into things like the movement of galaxies, we see that we can only understand and explain about 5 % of what we observe,’ says Prof. Benedikt, who is also the project coordinator of EuroCirCol. Another question bound to be asked is why a new collider is needed when construction of the LHC, the world’s largest science facility, was only finished in 2008 and cost around EUR 4 billion. For a start, the LHC is not sitting idle. It’s hunting for further particles and signatures of physics until the mid-2020s, after which it should be upgraded for ten years with a boosted rate of particle collisions. Tim Berners-Lee, a British scientist at CERN, invented the World Wide Web in 1989, but the LHC also led to other breakthroughs like hadron therapies for treating cancer and medical imaging advances. According to Prof. Welsch, the next LHC could lead to more radiation-resistant materials that can carry greater power, which is applicable to future nuclear reactors and power networks. Prof. Benedikt is confident the accelerator design concepts ‘will lead to the performance we want and need’. A prototype of the advanced cryogenic beam vacuum system required for the FCC is already being tested in Germany, but whatever the final concept, Prof. Benedikt says 2018 will shape technical requirements and feed into the FCC study to kick off preparations. The formidable feat of creating the next LHC would require global cooperation, heavy funding and researchers still active in 20 years, by which point Prof. Welsch reckons he’ll have retired. Next How did 3D vision develop? How is it determined that an organism is a new species?